Decks are very practical additions to have in any home since they are handy when you need more room for your activities. Additionally, they are extremely good for many outdoor activities which you can have especially when entertaining guests at your home. In effect, they increase the quality of your outdoor living to heights unimaginable. Decks in Columbia are not only for entertaining your guests, they are ideal for family bonding activities which you can do over the weekends or on bright sunny days. If you don’t have a deck installed yet, and you are planning to have one, then don’t hesitate to call up Eckhoff Construction. 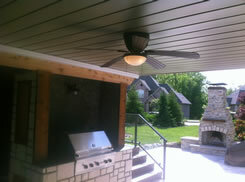 We will provide you the best outdoor deck you can ever see in Columbia, Missouri. When deciding on the kind of deck to install, think that it must reflect the kind of lifestyle you have. This will augment the quality of the activities you do. Most costumers need more room for entertaining purposes. There are a lot of things to consider when planning on the kind of deck you want. You can’t just build on any empty space out on your backyard. Professional services will come in handy when planning for any new construction in your homes. 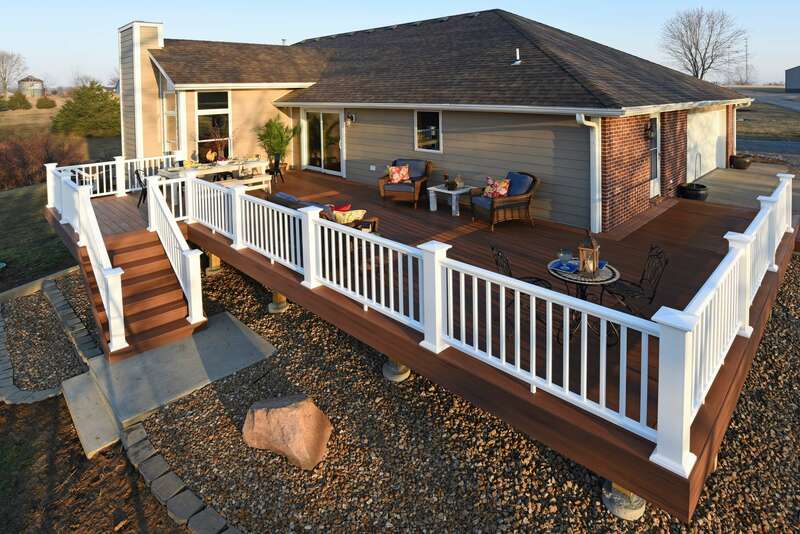 Eckhoff Construction in Columbia offers the finest deck building services. We don’t just build decks; we build the best decks in Columbia. Years of designing and building decks in the area and in nearby vicinities have given us a noticeable edge over our competition. We have made a big difference in many residences – in their over-all look and in how outdoor activities around them can be managed. As such, our reputation has garnered a better image through the years. We don’t build you decks to be just a “floor” outside your main house, we construct them in such a way that they become a highly functional sanctuary you can use the whole year round! When you want the best for you and your homes, you can’t possibly rely on just any average deck contractor you can find in Columbia. If you want to get the best for your investment, then you should hire the best deck builders who can provide you with the perfect services you need. With Eckhoff Construction, we give crucial attention to detail because we want to be able to deliver the best. Before anything else, we make sure that we and our client have an understanding of what needs to be done. We also consider what our client wants and what he can afford to spend for. In that way, we get to establish a good business relationship that will flow smoothly in the duration of our contract. We do this to avoid any clashing of ideas in the middle of the project. Your decks must blend perfectly well with your home’s whole environment. Thus, we make it a point to study the outlay of the surroundings in order to arrive at a feasible plan that will be easy to accomplish, without any other future difficulties. In this manner, we plan and design the construction of your decks in the way you want them. 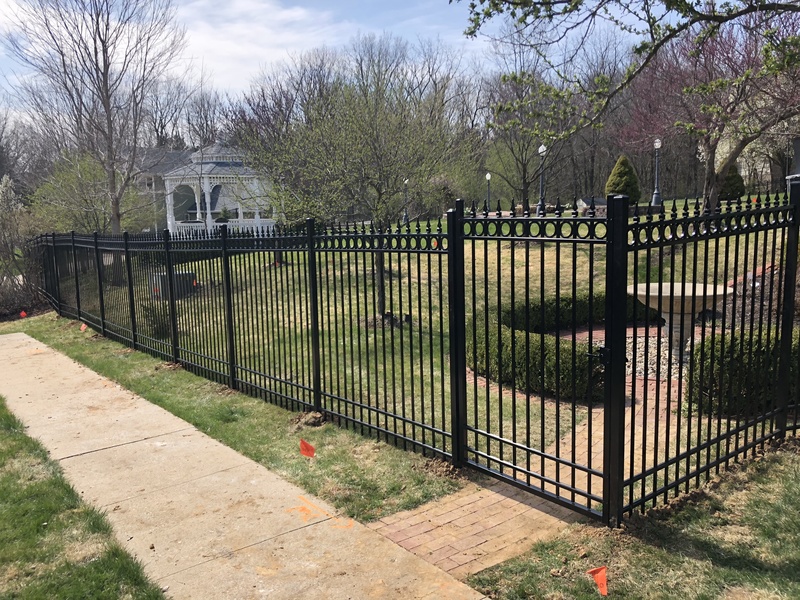 Many clients have expressed utmost satisfaction in the projects we have done for them in the past, and we are sure that you will find our services to your advantage as well. There is no room for mistakes for us. We work with precision and professionalism from the beginning to the final finishing touches. When you trust Eckhoff Construction with your deck building projects, then you are sure to receive just the best of what you expect from us. Building decks in Columbia, Missouri, has been one of our specialties the whole time we have been in this business. Over the years, our client list has grown into a long one because we have proven over and over again that we indeed deliver the best. Our workmanship reflects the highest quality in the construction business and we do not settle for less. The decks we build for you will efficiently provide you with what you need to accomplish your activities without difficulties. Imagine yourself basking in the warmth of the sun, with a deck to provide you with the best location to do so. You don’t need to go down to the beach every time you feel like soaking up the rays of the sun. With your highly functional deck in Columbia, you can practically sunbathe just within your homes! No more hassles of travelling down to the beach to get that tan you need. Just dab on your favorite sun block and be ready to enjoy the sun! Having barbecue parties will need not be a problem anymore because you will not want for space. With your brand new deck here in Columbia, you can just invite your friends over and start grilling your favorite steaks and get the party going for the better part of the day. You can have all the fun you want in the relative safety of your home. With your new deck to provide you the floor space you need, there is no fear of bumping into each other while going about your business. Your new deck will be the perfect place to have a sizzling barbecue! Eckhoff Construction will see to it that you get the perfect deck where you can spend all your fun-filled days. Your kids can spend all their after-class hours before dinner out there in your deck without you having to worry about their safety. Let them frolic around and never think about your deck disintegrating and causing them harm. Our decks in Columbia are built to withstand the worst pressure since we also make use of the best materials for building. We take into consideration your safety, so we always make it a point to ensure that we build highly durable decks for you and your family. There is absolutely no need to worry about your safety because we build our decks to perfection! We are the best deck contractors in the whole Columbia area! We offer varied materials when we build your decks. We have wood, composite and other ideal materials for whatever sort of deck construction you have in mind. We make all these available for you in order that we can meet your preferences and budgets. Suffice to say that the decks we build for you will suit into your lifestyles perfectly! Furthermore, the decks we build represent family-friendly and low maintenance but superiorly built projects. We assure you that your decks will endure for a long, long time. We make sure that we complete all the necessary steps in order to deliver an excellently built deck for you. With our decks, there is no need for you to worry about maintenance because we build them in such a way that you do not have to clean and scrape very often. You are sure to gain the most low-maintenance surfaces to enhance your outdoor living. If you want your deck to boast very appealing features, then we can accomplish this for you as well. With our ingenious craftsmen and builders, you get a deck that can be customized to fit exactly what you want. Artistry is never a problem with us because we know how to make your decks look great and function in an amazing way. Eckhoff Construction knows exactly how to build a deck that will be a dream outdoor space for you. Don’t navigate away from this site because you have just found the perfect place to have your dream deck built. We have the best services to be offered in the deck building business in Columbia. Get in touch with us for a free estimate. Better yet, let’s get started building your outdoor deck here in Columbia!